The expeditions of Rear Admiral Richard E. Byrd to Antarctica are well known, but many may not know there was a direct connection to Pitcairn Island as well. WWII was 3 months old. Ships with goods to sustain Pitcairn were not calling because of the perceived danger or the need to be elsewhere. 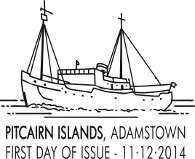 So when the USMS North Star, headed to Antarctica, stopped at Pitcairn for much-needed water on 13-14 December 1939, it was a welcome sight as the ship also had much needed supplies it was willing to share. Part of the sustenance bound for the Bay of Whales was beached at Bounty Bay -- 4,000 pounds each of flour and sugar, 10 crates of both potatoes and lard cases, 10 gross of matches, a barrel of gasoline and five gallons of lubricating oil. The North Star later replenished its stores in New Zealand. While some expedition members toiled conveying the larder, and others tended to the islanders' medical and communications equipment needs, 3 senior expedition members prepared to document the visitation in postal history. Richard B. Black; MD Alfred B. Geyer and expedition recorder Roger Hawthorne (see below) are credited with designing an intricate pictorial cachet (see cover) which was reproduced by mimeograph. Several proofs were made on the left side of un-imprinted government letter-size envelopes, one of which was "approved" for production by Admiral Byrd. The North Star was also carrying an important piece of equipment to be tested in Antarctica. The "Snow Cruiser" (built at the Pullman Company at a cost of $150,000) was doomed to be an eventual failure, but at this point, it was being heavily promoted. In fact, the Armour Institute, which developed the "Snow Cruiser," partnered with the Fidelity Stamp Company to produce philatelic covers commemorating its use in the Antarctic. So in fact, there were two different philatelic covers commemorating the North Star visit to Pitcairn. The "Snow Cruiser" cover is known to have been cancelled on the island as well as the North Star cachet. Personnel associated with the Armour Institute used that envelope for posting at Pitcairn rather than the North Star cachet. There were 794 North Star covers created on the mimeograph. Each North Star member received 10 cacheted envelopes. There were 77 USASE personnel present, and that would account for almost all of the covers. Several were also retained for "official" use, being addressed to senior officers. Not many postage stamps were available at the Pitcairn post office for franking the more than 550 envelopes cancelled there on December 14. The postage shortfall resulted in Postmaster Richard Edgar Christian initialling the cancellation to certify their prepayment. Some North Star covers were carried on for posting at Rapa Island on December 17. 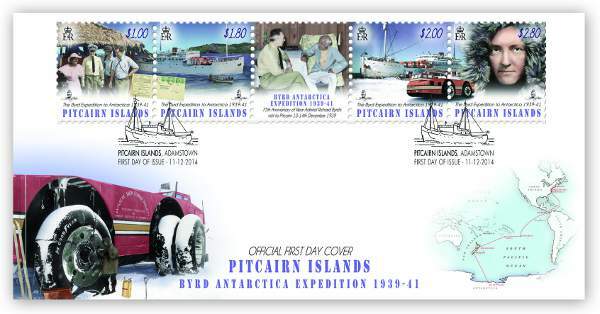 Thus the expedition, which left on December 14, was responsible for two of the most desirable Pitcairn covers. Today, both covers sell for hundreds of US dollars, and while they are scarce (especially the "Snow Cruiser" covers), there are many varieties, signatures, postings, etc. being studied by specialists. By the late 1930's the US government was becoming aware that interest in the Antarctic regions was gaining popular public momentum due to the successful earlier expeditions of Byrd. President Franklin D. Roosevelt took an active role in creating the United States Antarctic Service and pushed for more Antarctic expeditions, one by Richard B. Black and Finn Ronne, and the other by Rear Admiral Richard E. Byrd, to be coordinated to form the US Antarctic Service Expedition. Byrd�s plans for a third expedition to the Antarctic, like the first two expeditions, was to be privately funded. Late in 1938 Byrd became aware of the government�s position and decided to cancel plans for his private expedition and join ranks with the government. With his extensive knowledge of the area he was accepted as the leader and was to be actively involved with the planning and organisation of the expedition. Although a US Government sponsored expedition, additional support was needed from donations and gifts by private citizens, corporations and institutions. The objectives of the 1939-1941 Expedition were outlined in an order from President Roosevelt dated Nov. 25, 1939. The President wanted two bases to be established: East Base, in the vicinity of Charcot Island or Alexander Island and West Base, in the vicinity of King Edward VII Land, but if this proved impossible, a site on the Bay of Whales at or near Little America was to be investigated. Two ships with 125 crew and 4 aircraft were used by the expedition. One was Admiral Byrd's old ship, the BEAR OF OAKLAND, and the second the USMS NORTH STAR which was a 1434-ton wooden ice ship. Their journey to the Antarctica included Boston � Philadelphia � Norfolk (Virginia) � Balboa (Canal Zone) - Pitcairn Island � Rapa Island (French Polynesia) � Wellington � Dunedin � Antarctica. This motorized monster was 55 feet long and 20 feet wide, with sled runners attached to its bottom. With the wheels extended, it was 16 feet high. Inside the machine were 4 bunks, scientific and photographic laboratories, a radio room, a chart room and a galley. Twin 150-horsepower diesel engines were connected to generators which in turn supplied power for the 75-horsepower electric motor that drove each wheel. The rubber tyres were 10 feet in diameter. When a downgrade was reached, the wheels could be retracted allowing the Snow Cruiser to toboggan down the incline. Incredibly, the machine was designed to cross crevasses up to 15 feet in width by raising the front wheels while the rear wheels powered the cruiser half way across the gap, followed by a retraction of the rear wheels and a lowering of the front which then pulled the machine the rest of the way. The Beechcraft monoplane was mounted on skis and designed to be carried on top of the Snow Cruiser for aerial reconnaissance and exploration within a radius of 300 miles. Enough food for a year could be stored inside, along with 2500 gallons of diesel fuel, enough for 5000 miles of travel, and 1000 gallons of aviation fuel. The Snow Cruiser was designed for a maximum speed of 30 miles per hour on a flat, hard surface. She could climb grades of 37%, turn in its own length and move sideways at a 25� angle. View the Snow Cruiser�s infamous arrival visit here. Acknowledgements: This issue was made possible through the help of the following individuals and organisations: Dr Everett Parker; Laura Kissel, The Ohio State University Archives � Richard E. Byrd, Image # 7639_9; Barbara Boal, American Philatelist; Boston Public Library and Bob Breyer. Image in central tab shows Byrd chatting to Pitcairn�s oldest resident at the time, Charles Young.